THIS EVENT WILL HAVE A RESERVED SEATED GOLDEN CIRCLE IN THE 1ST 10 (TEN) ROWS OF THE ORCHESTRA, BEHIND WHICH WILL BE A GENERAL ADMISSION FLOOR. THIS EVENT WILL HAVE A RESERVED LOGE AND BALCONY SEATS. LOGE AND BALCONY SEATS WILL NOT HAVE ACCESS TO THE FLOOR. The members of the Dixie Dregs remained committed to attending the University of Miami School of Music, which hosted a lively and talented musical community during their tenure, including future greats Pat Metheny, Jaco Pastorius, T Lavitz, and Bruce Hornsby, among many others. In 1975, the group’s demo album, The Great Spectacular, was recorded at the University of Miami and then re-released on CD in 1997. 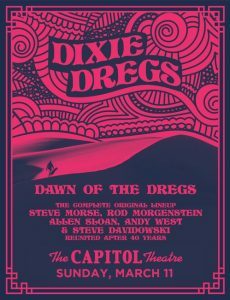 After graduation, the band moved back to Augusta where Steve Davidowski (keyboards) completed the band that would eventually emerge and become known simply as The Dregs. The band paid its dues and honed its skills playing in bars and venues throughout the South in the mid-70’s. They established themselves in the firmament of American instrumental music, seamlessly fusing rock with progressive and jazz elements to create a uniquely instrumental-driven style that has stood the test of time. Over the course of 40 years, the Dixie Dregs have released eleven commercial albums of original material, and a number of compilations, reissues, and countless live bootlegs also exist. Along the way they have garnered six (!) Grammy nominations. The band has played with several well-known additional alumni and guests — among others, Jerry Goodman (Mahavishnu Orchestra) Alex Ligertwood (Santana) and Jordan Rudess (Dream Theater) — and its original band members have played and recorded on well over 300 releases (including Deep Purple (Steve Morse) and Winger/Jelly Jam (Rod Morgenstein)).